So you decide to put together a media center device to start streaming online content. Well, you will need a good wireless mouse and keyboard media center remote. 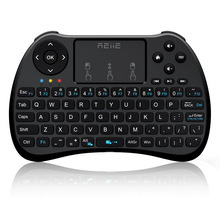 This remote should allow you to type in search words and maneuver around the screen. It should also let you pause and play your music and videos with ease. Media center remotes have come a long way and have become quite small. There is no need for a large bulky keyboard anymore. Most of today’s media remotes are very compact and functional. There are many HTPC media remotes to choose from. Let’s take a look at the best. The iPazzPort mini remote really crams a lot of functions into a package with the size and feel of a medium sized remote control. All the keyboard and mouse functions are on one side of the device and the AV remote buttons are on the flip side. Training the IR commands is very intuitive and much simpler than other types of learning remotes. The iPazzPort can be trained to mimic almost any IR remote control function. All of the keys are where they would be on a full-size keyboard in addition to a page up and page down keys on the side of the device. It also has a bright back-light that allows for night viewing. It has a short recharge time takes about two hours to fully charge the battery. This is an awesome remote and does exactly what it’s supposed to do. This is one of the best feeling keyboards you will ever put in your hands. The buttons are easy to press with a smooth feel to them. The Rii8+ comes in many different colors. The trackpad works great and the keyboard is very easy to connect. Just simply plug in the USB adapter and turn the keyboard on. The keyboard is no larger than an iPhone 6 and navigating is quite easy. The entire device has a nice soft finish to it, so fingers slide effortlessly from one key to the next. The upper left-hand buttons, allow you to control music tracks without having to switch windows, which is very convenient. This remote has a nice backlight feature. You can access everything with this keyboard including search, volume, next, previous, pause, play, mute, and scrolling features. Great product, great price and great design. The Hausbell mini H7 is a very nice and compact wireless mouse keyboard remote. The mini wireless keyboard is almost the same size as a galaxy s4 phone. The keyboard has a built-in mouse pad making it very convenient. The design of the mouse clicker is on the top corners of the keyboard with the arrows keys on the top left, similar to a game console controller. The remote has a built-in rechargeable lithium battery supporting a long time working and short time charging. The Hausbell H7 has every button you could need on it including a volume, home, search, www., and even a .com so you can use this for any situation. It also has a good range so you don’t need to be on top of the receiver. Everything about this remote is solid. It has a sleek look. There is a convenient spot to store the receiver under the battery cover on the back. Great remote for any couch potato. The FAVI FE01 Mini is a very thin remote which contains a rechargeable lithium battery. It has a mini USB receiver that hides in a compartment within the keyboard. The keyboard itself also has a micro USB jack for recharging either from a PC’s USB jack or a USB charger. The touchpad works extremely well. The keyboard has arrows buttons under the touchpad which allows for navigation through TV menu options. There are HTPC controls along the top and just about any function a regular keyboard can do it can do via a function key. This device has a very effective backlight for easy nighttime navigation. It comes complete with a built-in laser pointer and is compatible with any device that supports a standard USB keyboard. The keyboard also features an auto sleep and auto wake mode. If there is a long period of inactivity, the keyboard will automatically go into a sleep mode. For what you pay, this little thing is absolutely amazing. The Aerb X-A8 2.4G is a multi-axis handheld pointing device. This device is small and lightweight. The top of the remote is very standard. It has numbers, media keys and functions to turn on and off the wireless mouse. It also has 5 programmable keys for learning IR devices which are very easy to program. The back of the remote has a 38 rubber button and a texting style keyboard. It has lots of options like a gyro mouse, d-pad, and arrow keys. The keyboard works great and has good range. It so much better than clicking on the on-screen keyboard. The remote is comfy and has most of the buttons you need. This remote works great for watching videos on a TV connected to the computer. You can easily mute and change the volume on a computer. The keyboard space bar on the back works for pausing on most media players. It also works well for browsing the web, checking email and doing other quick things on a computer. This remote pairs well with Linux, Kodi and Windows. Check out our post on the best Kodi Android TV Boxes. A good remote can make a huge difference in your entertainment experience. It allows for seamless control of your media device. 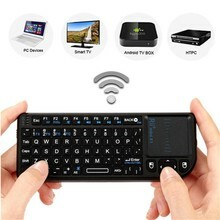 Now that you are armed with the right wireless mouse/keyboard HTPC media center remotes, I hope you will use one when watching your next online movie.